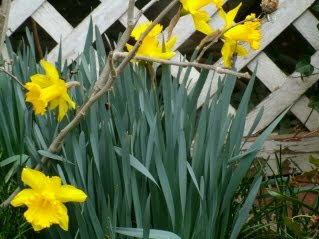 What is it about Spring that always makes us feel better? Is it that we've just about had enough snow for a while? Is it the prospect of warm, but not too hot weather? Lower heating bills before you need the air conditioner? Fresh vegetables soon arriving in the farmers' markets? I'd vote for all of those plus a few more. Asheville gardens here in the Montford Historic District include many old trees and shrubs as a backdrop, so you always have the sense that the gardens and the old homes seem to "fit" well together. 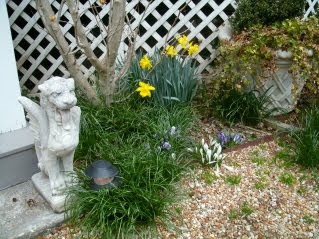 And whatever the perennials, annuals, blooming shrubs and roses that put on their show from Spring til Fall will also "fit" the character of Montford. At this bed and breakfast, the gardens have a deliberate English character.As luck would have it, the architect who designed this house over 100 years ago was himself from England. So, winding pea gravel paths, lattice fencing, raised flower beds, hundreds of boxwoods arranged in symmetrical patterns were all added in the early-to-mid 1990s when I designed these award-winning gardens...creating the garden backdrop to "fit" the English character of the house that is now Abbington Green Bed & Breakfast Inn. Early Spring in the bed and breakfast gardens may require some close observation to see the treasures. 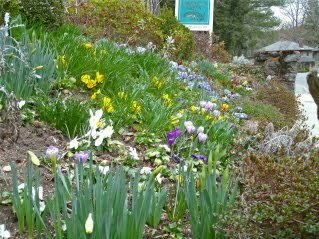 Winter and early Spring are more "subtle" times in the gardens.Lots of ground still appears to be bland and uninteresting. 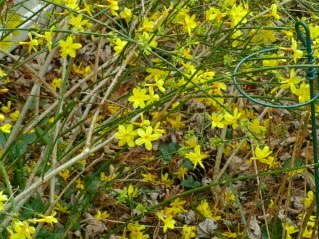 But look closer to see the bright yellow Winter Jasmine, little crocus in white, purple and yellow, and early-blooming varieties of daffodils. 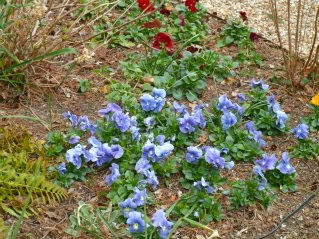 And of course, we've added pansies...a colorful treat that can withstand the very-likely snow we may still get before May. A visit to gardens here is always a pleasure, especially if you can make it your business not to be in a hurry.